It’s delicious with meat like pork, for dessert with some yogurt or other fruit or for an easy lunchtime addition to your kids’ lunch boxes or after school snack. It’s even easier in a slow cooker. No stirring or waiting by the stove. Your kitchen will smell delicious. This week, I ordered an extra lot of Cortland apples in my CSA box and I had forgotten quite how large these apples are. As soon as I saw them, I knew I had to make applesauce out of them. 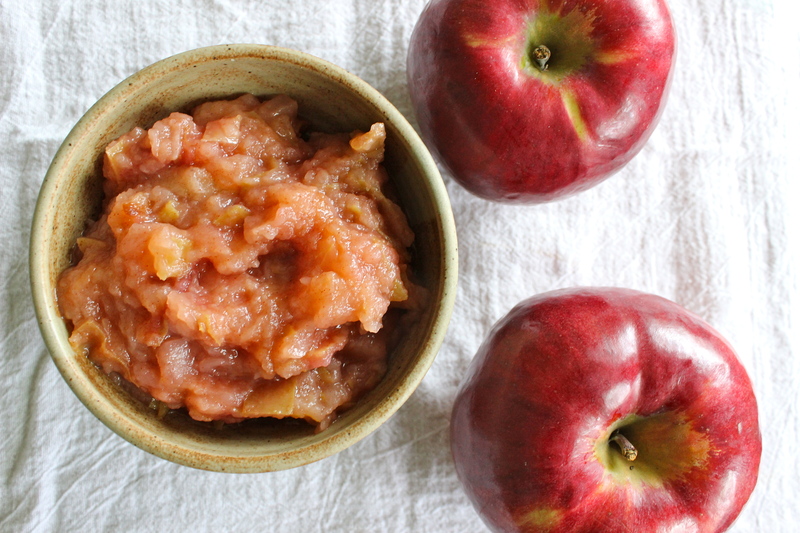 Cortland and other varieties like McIntosh are soft and sweet and cook really nicely into applesauce. If you are in the UK of course you can use good old cooking apples too which also cook brilliantly and are tarter. I never use sugar in my applesauce – just a little sprinkle of cinnamon. You could also add freshly grated ginger or nutmeg too. 10 medium or 6 large apples (cooking, Cortland or McIntosh are great varieties) – cored and diced into small pieces. You can peel them if you want to. Place the diced apples, cinnamon, lemon juice and water in your slow cooker. Stir everything together. Cook the apples on the Low setting for about 6 hours. Mash the mixture with a fork or potato masher or blend with a handheld blender if you want a really smooth applesauce. No slow cooker? Don’t worry. This is also easy to make in a large pan. Place all the ingredients in a pan and cook covered on a low heat for a about 30 minutes, stirring occasionally.